Our banner advertising space is offered in 6 (six) and 12 (twelve) month periods and is available at a highly competitive rate. 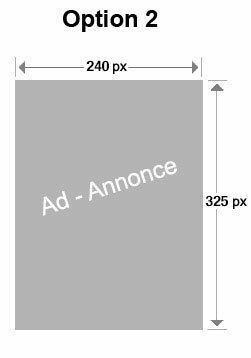 Please provide your banner ad in gif, jpg or png file format. 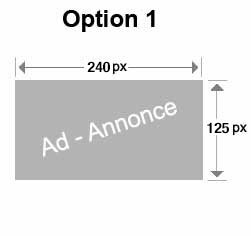 The dimensions must be either 240 px by 125 px (Option 1) or 240 px by 325 px (Option 2). The recommended file size for Option 1 and Option 2 should not exceed 150 KB. For more information on advertising rates, please contact the Harbour Authority of Cheticamp today! Please visit our Contact page for the different methods by which we may be reached. Option 1 or Option 2 is not exactly what you are looking for? Why not contact the Harbour Authority of Cheticamp and let us taylor a package that will meet your advertising requirements. All banners are subject to approval prior to ad publishing.